4.1 The previous chapter highlighted the customer experience when connecting to the National Broadband Network (NBN). Evidence to the committee drew particular attention to the experience of customers when connecting to the nbn satellite service—Sky Muster. Drawing on some themes discussed in Chapter 3, this chapter presents the committee's evidence about the customer experience as it relates to Sky Muster. 4.2 nbn's Sky Muster service comprises two satellites: the first (Sky Muster) was launched in October 2015 and commenced operation in May 2016, the second (Sky Muster II) was launched in October 2016. The Sky Muster service is designed for homes and businesses in rural and remote Australia that fall outside the fixed line and fixed wireless areas. 4.3 The Sky Muster satellite service covers mainland Australia and Tasmania, and remote islands such as Norfolk Island, Christmas Island, Lord Howe Island and Cocos (Keeling) Islands. 4.4 Prior to Sky Muster, satellite services were provided by the Interim Satellite Service (ISS) which ceased operating in February 2017. The Department of Communications and the Arts (the Department) provided detail about how Sky Muster compares to other Australian satellite services since 2005. 4.5 In their Full Year Results 2017, nbn reported 418,135 premises ready for service (RFS) and 74,931 active end users connected to Sky Muster as shown below. 4.6 Table 4.3 below outlines satellite coverage and number of activations by jurisdiction as reported in the nbn weekly report to 31 August 2017. 4.7 The committee received evidence from a range of individuals and organisations describing their experiences using the Sky Muster service. Some witnesses and submitters outlined positive experiences however, much of the evidence to the inquiry focused on the challenges to access and use Sky Muster. ...we don't have millions connected in the south-west as yet, but I have had four reports in the past three months of people being very positive about their experiences on the Sky Muster satellite, achieving speeds in the range of 22 to 23 in download, and an upload of 2½ to 3½. So, for many of those people who've had very ordinary ADSL services in the past, they are really quite impressed with the improvement in service. 4.9 Mrs Rachel Hay, Data Analyst, Better Internet for Rural, Regional and Remote Australia (BIRRR), advised that many comments included in their research say that 'when it works it is fantastic'. When the system works, the speeds achieved are appropriate but the data allowance is not. the appropriateness of the allocation of satellite to particular areas. 4.11 As with fixed line connections, Sky Muster customers enter a contract with their preferred RSP to access satellite services on the NBN. According to nbn's website, there are currently 11 RSPs offering Sky Muster services. 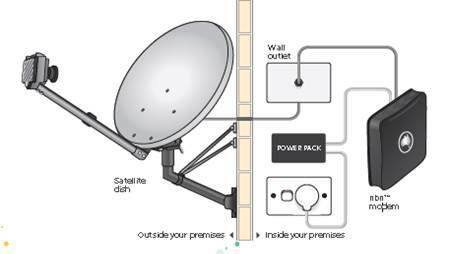 4.12 As shown in Figure 4.1, the equipment installed is comprised of three components: satellite dish and cable that connects the dish into the property, wall outlet, and nbn modem. Some installations may require a power pack, depending on the installation location. Once your nbn supplied equipment has been installed and checked by the nbn approved installer, depending on your service provider, you can commence using your Sky Muster service. If you have problems connecting to the internet, you should contact your service provider to have your service activated. Once you have an active service you can connect your equipment to your nbn modem...and begin enjoying your new service over the nbn network. 4.14 The committee heard evidence that for many customers the installation and connection process had not been a smooth one, particularly in relation to missed technician appointments and poor communication about the installation and connection process. A technician failing to fulfil an installation appointment or unable to complete the installation on the first appointment is particularly problematic for customers in rural, regional and remote areas due to the distance to travel and the subsequent additional time required to undertake a follow up appointment. 4.15 Several witnesses and submitters reported multiple missed appointments. BIRRR submitted that some Sky Muster customers have experienced up to 12 cancelled installation appointments. The committee was also advised that there can be long delays between ordering a service and installation. In some cases there have been delays like that that we have heard of when there have been problems with installing technology and handovers between different contractors and lack of information and lack of communication between contractors. An example just this week was one contractor comes out and it is a tiled roof and he does not have the equipment and he has to go away. A second one comes out all the way from Melbourne and does not have the equipment or there was some other issue. Installers have had issues with orders being placed by delivery partners on a daily basis, resulting in no common sense 'milk run' installations being able to occur. Often installers are sent to install a service many hundreds of kilometres away, only to travel back along the same road two days later. Members report the difficulty of being able to contact the individual technician prior to them travelling to remote properties. The different levels of people that need to be contacted and dealt with include the service provider, NBN, the installation company and the technician, who often do not seem to be able to see reports generated by different levels. To be asked to provide photos of equipment installed and email them to the service provider when you have no internet coverage seems to show a complete lack of understanding of where some of these locations are. 4.19 A survey conducted by BIRRR found that 20 per cent of Sky Muster services did not activate on installation. 4.20 Submitters and witnesses highlighted issues once connected to Sky Muster including: slow download and upload speeds, frequent drop outs and intermittent service, insufficient data capacity/quotas, adverse weather conditions affecting connections and latency issues on voice services. 4.21 In its submission and at the public hearing in Townsville, BIRRR explained a number of challenges reported to their organisation. 4.22 BIRRR advised that the current speeds on Sky Muster (i.e. 12Mbps and 25Mbps) were working well however service reliability is an ongoing issue. The voice latency, particularly from Sky Muster user to Sky Muster user in different parts of rural and remote, can be quite severe, particularly for children. This has been related to me a number of times from different members who have children on distance education. When there is a latency of 1.6 seconds or so, it breaks down our human ability to communicate quickly. It staggers conversations that, previously, they had had quite easily on the copper system or on the systems that they had before. 4.24 Several submitters noted they are experiencing a high frequency of drop outs, particularly in wet and stormy conditions. The nature of extreme weather conditions common within the Northern Territory, especially in the coastal regions, makes satellite unreliable due to rain fade and loss of signal. In a natural disaster satellite communications are likely to fail precisely at the time a community needs them the most. Issues with 'rain fade' are also a considerable impediment to take-up of nbn satellite service. Nbn Sky Muster is an all Ka band satellite system. Ku band, Very Small Aperture Terminal (VSAT) systems may provide up to 99.95% availability, while Ka band availability is generally poorer at around 99.5% for a similar VSAT cost. '99.5% availability' means that a customer can be off-line due to weather effects, for up to 50 minutes per week or greater. Sky Muster customers are recording weather-related outage events of these magnitudes on a regular basis. In addition, rain fade affects the major earth stations and not only customer dishes. When weather takes out an earth station it also takes out thousands of Sky Muster services. The launch of the NBN Sky Muster program was beset with issues from the beginning, starting with the mode of how to connect customers. After launch we faced a service dogged with unreliability; daily minor outages through to major ones lasting many days; installers failing to arrive—some on multiple occasions; delays to installation; activation and dropout issues; speed and performance issues; slow or non-response to tickets; and, of course, managing the fair use policy of the NBN. Contrasting previous programs, the NBN Sky Muster program shows how industry often delivers a better service where we have control over the install process—which we do not in NBN-world—and customers do not understand this, so they always refer back to the service provider. There is very little visibility over the network and outages on other platforms were rare, and we have no control over this with the NBN. As a result, over the following eight months calls to our help desk increased by 250 per cent, requiring additional staffing, training costs and placing stress on our staff, who were often without the insights or ability to control the customer-facing issue. TIOs [complaints to the TIO] increased to unprecedented levels and our reputation on social media was tarnished. I do not want to understate the reputational damage that is suffered when, as a service provider, you are left with communication tweaks to respond to customers and daily dealing with brand damage issues. 4.29 At the wholesale level, two speed options are available to RSPs on Sky Muster: 12Mbps download with a 1Mbps upload, or 25Mbps download with a 5Mbps upload. 4.30 As detailed in the Full year results 2017, as at 30 June 2017, 66 per cent of Sky Muster customers have chosen the 25/5 speed plan (see below). 4.31 nbn has a Fair Use Policy that applies to Sky Muster—this applies between nbn and retail service providers (RSPs). RSPs may also have a separate fair use policy which applies to households. Satellite capacity is a finite resource and nbn plans to work closely with internet service providers to help ensure they manage capacity properly, so that everyone has access to a great online experience. 4.33 Under the Fair Use Policy, nbn places useage limitations on its customers (i.e RSPs). In the event that RSPs exceed the mandated limits, they are required to pay additional charges and, in some circumstances, nbn may decline orders or suspend supply. 4.34 RSPs can request that nbn waives obligations under the Fair Use Policy for Public Interest Premises—a premise used for a public interest purpose including an indigenous community organisation, not-for-profit organisation, educational facility, health facility or local government facility. 4.35 Evidence to the committee noted the current range of Sky Muster products are not meeting the needs of the community, with particular reference to: cost, speed constraints, download restrictions, and the limit of one plan per premise. NBN pricing on satellite is not seen as being as competitive with other forms of NBN service, reinforcing the idea that rural customers are paying more for an essential utility than their regional or city-based cousins. Download limits of a maximum 150 gigabytes, plus 50 gigabytes per student up to an additional 150 gigabytes per household, are in place on the Sky Muster satellite service. This does not provide modern download limits to rural areas. 4.37 Customers are currently limited to a single Sky Muster plan per premise which particularly poses challenges for residential premises who may also be operating a business. There are some limitations in the nbn design which are preventing consumers from getting full benefit from Sky Muster services. Limitations in the plans, particularly the Fair Use Policy (FUP) over Sky Muster services, are restricting use by regional, rural and remote consumers. Generally, consumers are limited to having one plan per location. This severely limits many consumers who are trying to run businesses, offer employees and tourists' data and possibly study for tertiary education qualifications as well as general residential use, all from one limited plan. ...the average household monthly usage for families connected to NBN is 141 gigabytes per month. The maximum peak available to a Sky Muster user is half of that: 70 gigabytes. A survey conducted by BIRRR, in late 2016, highlighted that 51 per cent of Sky Muster is used for business. Far too many regional users are being forced onto Sky Muster, which, by any measure, falls a long way short of the capabilities promised by NBN. This is a system that frequently does not allow for the absolute basics, such as internet banking, and is not in a position to contemplate, let along capitalise on, the technical revolutions of the future. Some of the respondents said they want to be able to update without using all their peak data. If they want to update their programs, they have to wait until between 1 am and 7 am to try and set that up. Some of these people do not know how to use technology. They know how to turn the computer on and open their email or their browser, but they do not know how to set up something to update at a different time. A lot of them want to do research on their business. A lot of them are looking at doing webinars about how to conduct business and improve their business skills. They would like to FaceTime or Skype with people, which you cannot do currently. Nearly seven per cent of them cannot even get onto social media; they cannot even have communication with other people through social media. There have been a lot of problems with the rollout of Sky Muster so it has been unreliable and NBN is on the record for saying that they are having 'worse than teething problems' in addressing that. The big problem that people are experiencing with Sky Muster in remote areas is that they want more data than is being provided on the plans available and also that they are limited to off-peak and on-peak plans, which affect their usage in various different ways, particularly if they are running businesses. I am sure you have heard of the hashtag called #datadrought. There is a huge cry out that people should be able to purchase more data if it is available, particularly in very remote areas where they have no other options. Some people on Sky Muster still have mobile broadband as an option where they live so they are bolstering their usage with that. Some people are choosing to just use that and not go on Sky Muster but of course that is a more expensive service. 4.43 Witnesses explained that there is a general community expectation in rural areas that services on Sky Muster will differ from plans offered in city areas and places of high urban density. Whilst this was noted, it was stressed that the plans on offer should not be cost prohibitive and should be structured in a way to meet the needs of the community. Yes, I understand that there does need to be some sort of fair use policy, but it also needs to be fair itself. Having a fair use policy is not a problem, so long as it matches community standards and expectations of what fair use of data is. If the data that is being provided on Sky Muster is a quarter of what the average user, as NBN Co has stated, is currently consuming, then that, to me, is not right and should be rectified. We should be keeping Sky Muster to a reasonable standard from what the average user on NBN is consuming so that we can try to maintain and close the gap that is currently broadening every day. The longer that this keeps going and the less data that is rolled out for Sky Muster users, the worse off anyone in that footprint is going to be. 4.45 The committee notes that the rollout of the NBN always included a satellite service. Throughout the inquiry, several submitters and witnesses expressed concern about the increased number of premises assigned to Sky Muster. But there are way too many people who are mapped for Sky Muster. I live 11 kilometres from Charters Towers. I can pretty much see a fixed wireless tower from our roof, but it beams back over Charters Towers. I am by no means remote. I should not really be on Sky Muster; we should have more fixed wireless towers. There are whole towns being taken off ADSL and put onto Sky Muster. We are quite alarmed that, as the program continues on, there is over-subscription on some of the sectors on the satellite. We are concerned that the people who are put onto Sky Muster are those who really need it, as opposed to shuffling people on because it is the easiest option at this point. We are firmly of the view that fixed wireless options have much greater reliability and accessibility for a large number of people that have been put onto Sky Muster. In the original discussion around satellite it was to be a technology of last resort, not an infill mechanism. We're finding that some areas where there was an expectation for at the very least fixed a wireless connection are now being coloured in on the map, if you like, as ready for service using satellite. If it's an interim measure, we can live with that and it's fantastic that those people are being connected; if it's a long-term measure then it's not fine, because that is to the detriment of those areas, particularly if you have fairly local metropolitan areas or regional centres where people aren't able to take advantage of reasonable internet. There have also been instances of people who would like to subscribe to the NBN network being told that Sky Muster is their only option, but they are actually eligible for fixed wireless connections. Due to maps not being updated in a timely manner, their application is being refused by the RSP. This causes a lot of toing and froing, and this type of misinformation causes great confusion for members. There needs to be one point of contact who advocates for the customer during the installation or fault repair process. 4.50 Ms Lee Longmire, a community member from Nerranderra Shire Council who resides in a Sky Muster area, informed the committee she received advice from a private company that a fixed wireless signal may be available at her house despite being outside nbn's designated fixed wireless footprint area. 4.51 The committee heard evidence of entire communities being assigned to Sky Muster in contrast to neighbouring communities who have been assigned other technologies such as fixed wireless or FTTN. 4.52 Kaniva, a major township of West Wimmera Shire Council (WWSC) in regional Victoria, has been assigned to the Sky Muster satellite service. A number of towns surrounding Kaniva (including Bordertown and Nhill) are being connected to the NBN using either fixed wireless, or FTTC, using existing infrastructure running through the Western Highway. Kaniva's main street is the Western Highway. 4.53 WWSC has made representation to nbn and the Minister for Communications' office to seek to have the decision about the choice of technology changed. The Mayor of West Wimmera Shire Council, Councillor Bruce Meyer, questioned the equity of the situation when Edenhope, another major township of WWSC, is similar in size and population to Kaniva, had been assigned to receive a mixture of FTTN and FTTC. There are a significant number of communities we have identified where there is fibre running through the community that is owned primarily by either Telstra or folks like Vocus where the only available NBN service is Sky Muster. We don't quite understand why these communities aren't being offered fixed line services or at least fixed wireless services rather than Sky Muster given their proximity to existing fibre. We have actually expanded our fixed wireless network into areas that are covered by NBN's Sky Muster, so we have our own fixed wireless network. Why would you connect to that network? One is latency—that is, the responsiveness of the network is far better on a terrestrial service than having to go all the way up to the sky and back down again. The second is that you can choose the plan that suits your data limit. I think that is right. I think there are many opportunities for people to connect. If they have ADSL available and it is okay, and then you hear of some of the issues you have heard about Sky Muster, why would you change? 4.56 Several witnesses told the committee that people are delaying connecting to Sky Muster and waiting to see if decisions are made to provide another technology option in their area. 4.57 Whilst acknowledging the challenges being experienced on Sky Muster, several witnesses observed there had been recent improvements. Certainly in the last four months [prior to the public hearing in April 2017] the service has stabilised considerably, but is still the cause of much of our support efforts and complaints. While I share many of the concerns... about the introduction of Sky Muster—and we have all experienced very similar issues—I also have to agree that the service has stabilised and the issues that were dogging us last year seem to have largely passed. We are, as a forward-looking company, looking to the future. A lot of the people within the Sky Muster community had round-robin discussions amongst themselves and were saying, 'This has gotten beyond acceptable', and that is when NBN management did respond with some work to look at what some of these core issues were, and that is when we saw improvement. But it was not until that happened. 4.61 Earlier in 2017, nbn introduced a dedicated 1800 number to respond exclusively to Sky Muster matters. Although this additional avenue to request assistance was welcomed, concern was raised that the community was largely unaware of the number as it was not promoted on the nbn website. Witnesses advised the committee that community members were aware of the number only after hearing about it from others. I do know about the call centre. It is very, very hard to find their phone number... If you go online to their website, you cannot track it down... When I am getting queries from residents, I generally make sure I pass that number on. If it is a general inquiry and I can answer it then I will answer the query in the first instance, otherwise I refer them to the website and the call centre. The development of a specific regional team within the nbn call centre has also been a welcome addition, however there needs to be much clearer communication of roles and responsibilities so it is clear which issues this team can assist with, and which issues are specifically related to providers or end users. 4.63 As an extension to the call centre already established, it was suggested that nbn officials responding to Sky Muster queries on the information line should have a good understanding on the particular issues affecting rural, regional and remote communities. investigate options to ensure the capacity of the satellite, including by limiting use of the satellite to rural and remote communities and increasing the number of premises assigned to the fixed wireless footprint. The new nbn Sky Muster™ plans are expected to be available through retailers in October 2017. An extra 35 gigabytes of peak data would allow, for example, a business to do 50 more hours of high definition videoconferencing with colleagues and clients, or a student to do 25 more hours of watching university lectures each month, or a photographer to send an extra 3500 pictures a month. Yes, they have recently increased them [current Sky Muster caps], but we have had discussions with them over the last couple of weeks about what techniques you could use within the network to increase them even further. We are sharing with them expertise around what we have done, the techniques we have used in the US and Europe, to make the satellite more landline like, if I could use that term. That includes things like traffic-management techniques that you can apply to your network, and there are other things you can do within the core of the network to make it look like, from a customer-experience perspective, that you have a greater capacity than is really there. The whole secret of satellite technology is to try and make the satellite technology as transparent as possible to the customer and give them as landline like an experience as possible. 4.68 The ability of nbn to announce increased data limits reinforces the concerns raised by a number of witnesses about the lack of transparency when it comes to Sky Muster capacity, data provisioning, and the modelling and assumptions that underlie the Fair Use Policy. 4.69 Witnesses who appeared at public hearings after the announcement about increasing data caps indicated their support for the increase. 4.70 Several witnesses and submitters advocated for additional plans to be available for Sky Muster customers: allowing for multiple plans per premise as well as introducing a business plan for Sky Muster customers. A guarantee is needed that additional Sky Muster capacity is reserved to increase data allowance to current users, and that more plans are allowed per location for business use and by students, in addition to the current education port data allowance for distance education students. This will ensure that those that rely on Sky Muster the most are able to make use of it. Yes, absolutely. I think that was a really good suggestion or recommendation. The Mansfield shire and the broader Mansfield community would absolutely support having the opportunity and doing that in a way that is equitable and affordable. I think that is appropriate. 4.73 Mrs Judith Charlton, Chief Executive Officer, Narranderra Shire Council agreed that equitably priced business plans will address some of the capacity challenges on Sky Muster. Currently, I have an understanding that with Sky Muster there is a prevention on having more than one plan per premises. That will be a fundamental thing that needs to be looked at being shifted and adjusted to recognise that for anything to do with, say, farmhouses like mine, we need to be able to possibly bundle a plan that can access more data so that we are not restricted to only being able to operate our farm and still say to the kids: 'I'm sorry, that's the farm data. You still can't use it.' That needs to be recognised, I think. It needs to be multipurpose. 4.76 A variety of views were presented to the committee suggesting options for ensuring ongoing capacity of Sky Muster services including reducing the number of people on satellite and extending the fixed wireless footprint. To maximise equity and to ensure that farmers and other regional Australians can enjoy the benefits of an NBN service that is comparable to that provided to metropolitan residents, the South Australian Government requests that satellite connections only be deployed as a technology of last resort when no other fixed-line options are feasible. ...while I think fixed wireless has been a success and is an Australian first—and I think NBN Co should be congratulated on that—I would like to see it more widely deployed to actually take the pressure off satellite where satellite is really not the best solution. Unfortunately, I think, to a degree, the fixed wireless has not been explored. As I understand it, if there aren't sufficient premises within the fixed wireless cell, then they recommend satellite. The most obvious thing might be—and this is just my idea—that initially someone would be provided with satellite but with the option, when there are sufficient numbers, to move to fixed wireless—in other words, some idea of really addressing the infrastructure and the demand in a particular area which is not so much, shall we say, dictated by, 'You'll have satellite and you will have fixed wireless'. There are people on the urban fridges of Melbourne and Sydney who are put onto Sky Muster. I do not understand that. To me, that is crazy. Why is the Sky Muster service being chewed up by people who live in an urban fringe? To me, that is not right. I think the original intention—from when Sky Muster was being rolled out—has been sort of smooshed around a bit and used as Spakfilla for all these gaps that cannot actually be filled, because it costs too much to put a fixed wireless tower up...What Sky Muster seemed to have been originally touted as has now been morphed into this bigger thing, and I do not think the capacity is there to support it, especially if we have such tiny data allowances associated with it. The AMA believes there should be much greater focus by the Government on finding ways to extend the boundaries of the NBN’s fibre and fixed wireless footprints into the satellite footprint wherever possible to lessen the reliance on satellite for those living in rural and remote Australia and to address the increase in internet usage over time. When we go into regional Australia to towns that see a new tower going right up on the edge of town, an NBN fixed wireless tower, we often get the question, 'Why can't that also deliver a mobile signal? Why have we as taxpayers invested in that tower yet we don't seem to be getting the services we want and need?' The answer is: it could deliver that. It is simply a question of whether there is an expansion of focus, an examination of the ways in which NBN could deliver enhanced services for regional Australia. 4.83 At the public hearing in Sydney, Mr Bill Morrow, Chief Executive Officer, nbn, noted that while nbn towers were being used for shared services with mobile companies, nbn was not considering delivering a wholesale mobile service via the fixed wireless infrastructure. I have been calling for four years for a third satellite to be ordered. The third satellite should provide telephone services. We have heard a lot of issues about the Sky Musters being Ka data satellites. The new satellite should be a combination of data and voice, in that it will provide single-hop voice, but it should also, because of the changes in technology, be able to provide as much as both of the existing Sky Muster satellites. For the cost of one Sky Muster satellite, we can double capacity. Satellites have a 15-year life. By the time the NBN is over, one of those satellites will be one-third of the way through its life. Ten more years and those two satellites will be gone. If we do not order another satellite now, then we are going to have a big problem. We're the ground station infrastructure partner of NBN, having built its 10 satellite gateways or ground stations, it's two data processing centres, and to date we've supplied over 80,000 residential modems and dishes to users across the country. We're helping NBN on their mission to ensure a connected Australia. 4.87 The committee notes that the provision of a satellite service to premises outside the fixed line footprint has been an accepted part of the NBN since the project's inception, but was always intended to be a technology of last resort. 4.88 The committee accepts the evidence which shows the implementation of Sky Muster has been beset with problems including through the initial installation, in fault rectification, and in network stability. These issues should have been anticipated. 4.89 Evidence before the committee suggests that the current rollout is not proceeding by allocating satellite broadband as a 'technology of last resort'. The committee notes the evidence that Sky Muster is being used to serve areas that were previously intended to receive NBN through fixed wireless or some form of fixed line broadband. In addition to delivering satellite broadband to areas that could be served by a better technology, this approach will dilute the satellite capacity for those who are reliant on this form of broadband. 4.90 The committee emphasises that satellite broadband is clearly a last resort technology and it should be applied as sparingly as possible in order to avoid exacerbating the existing digital inequality between metropolitan communities, on the one hand, and rural, regional, and remote communities on the other. 4.91 Evidence to the inquiry indicated that a number of Sky Muster customers have experienced challenges with their service. The committee heard that the application of nbn's Fair Use Policy is impacting the ability of Sky Muster customers to use the NBN to its full potential. The committee believes there should be a benchmark for a reasonable data allowance, perhaps by reference to average data use across the fixed line network. 4.92 The committee welcomes the announcement by nbn to increase the data allowance and notes that these new allowances will take effect at the wholesale level in October 2017. The committee notes assurances given by RSPs that the increased allowances will be available to customers at minimal additional cost. 4.93 The committee is of the view that there needs to be greater consultation with rural and regional end users in the development of nbn usage policy and nbn rollout plans. Establishing a rural and regional reference group would be an important step in improving the end user experience and increasing transparency. 4.94 The committee believes there is clear and compelling public interest in greater transparency and disclosure from nbn in relation to the satellite capacity, current data provisioning, and the underlying modelling and assumptions which determined data rationing under the Fair Use Policy. The nbn should provide this information to the public, and the committee will seek this information from the nbn. 4.95 The committee also welcomes the evidence from nbn that Sky Muster business grade plans will be available in 2018, but believes there should be an appropriately structured opportunity for an additional business service per premise. The committee will monitor this matter throughout the inquiry and will continue to seek assurances from nbn that Sky Muster plans are meeting the needs of the community. 4.96 The committee notes the evidence provided and the suggestions made about future proofing the Sky Muster service, with particular reference to increasing the number of premises assigned to fixed wireless. It is the view of the committee that there is merit in nbn undertaking some analysis about increasing the number of premises in the fixed wireless footprint. 4.97 It should be noted however, that an increase in the number of premises connected to fixed wireless will not be budget neutral due to the cost of that option in comparison to satellite. 4.98 The committee recommends that the Australian Government require nbn to identify and disclose all areas that are currently designated to be served by a satellite connection that previously were set to receive the NBN by FTTN or fixed wireless, and explain why the change has occurred. 4.99 The committee recommends that the Australian Government require nbn to develop a plan that would provide access to nbn's fixed wireless towers for the provision of mobile telephony. 4.100 The committee recommends that the Australian Government ask nbn to consider providing the capacity for separate business and residential Sky Muster plans to be made available at the same location when business grade plans are introduced in 2018. 4.101 The committee recommends that the Australian Government set a benchmark for reasonable data allowance on Sky Muster plans, by reference to average data use across the fixed line network. 4.102 The committee recommends that the Australian Government ask nbn to establish a rural and regional reference group (see recommendation 3) and that nbn consult on Sky Muster services and changes to policy and rollout plans.